As we near the end of our busy week of exciting activities during our Enrolment Week, we have been thrilled to welcome in lots of visitors again to join in our fun! 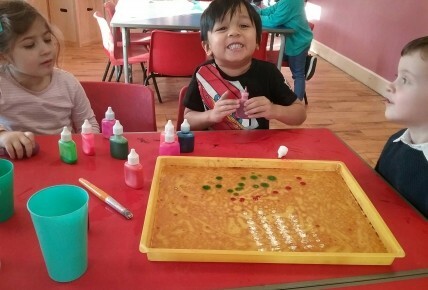 Today the children have enjoyed Thrill Seeking Thursday as we have been creating a range of marks using unusual techniques, including our one to two's using string dipped in different colours, to experiment with the different creations they could make. 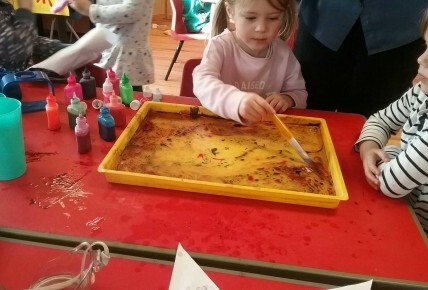 In pre-school the children have been using marbling inks to see the effects the different colours and movements they make can create weird and wonderful pieces of art. We hope you can join us tomorrow as we conclude our Enrolment week with Get Fit Friday. So be sure to bring your energy and Friday feeling along with you! !